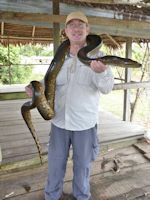 A visit to the Amazon jungle in comfort? Impossible you say, but it is possible at a good wilderness lodge like the one I recently visited in Peru. As do many of us, I based my preconceptions about the jungle on what I saw on TV and the movies. It was going to be unbelievably hot and humid. Constant torrential rain. The insects would be hard to control. I’d need boots to get about. Danger lies around every corner. Everyone I told before I left warned me, “Get your shots.” My doctors loaded me up with just-in-case medicines. All of this — nonsense. Four days in the jungle: There was only one rainy day, and I didn’t get sick. But being prepared for the unpredictable will help comfort you. The lodge where I stayed, Tahuayo Lodge, didn’t try to dispel the preconceptions. These misconceptions are a primary draw for many excitment seekers from around the world. Who’d want to trek two days to reach a place that wasn’t exotic and formidable? So the myths persevere, but reality sets in after a night or two actually in the jungle. On almost every block in Iquitos, the huge (estimates are between 500,000 and 1 million population) jungle city that serves the surrounding jungle, travel agencies and hotels advertise their favorite lodge. They typically have cabins with bathrooms. They use river water for toilets and showers. Drinking water is hauled in. Electricity is limited. The dim lighting makes it nearly impossible to read at night. Even in Iquitos, satellite-based Internet is slow if available at all. In the jungle, there is no air conditioning. You sleep under a mosquito net. 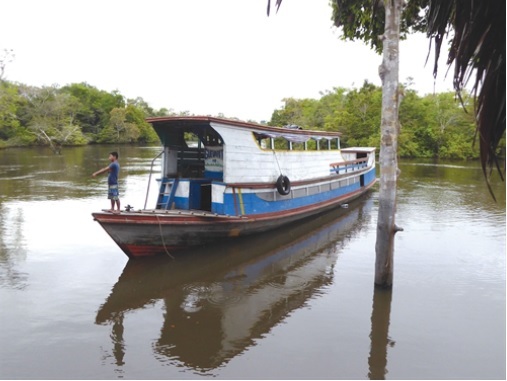 Access is by boat, usually many hours from the comfort of an Iquitos hotel, but the Tahauyo and other lodges manage to meet the jungle halfway. They make a stay fairly comfortable without destroying the allure of roughing it in the jungle. The jungle changes seasonally. When I visited in May, the wet season was beginning to dry out. You could see the water mark on trees decrease daily. By July — the beginning of the dry season — the wide-open rivers so important to exploring the jungle will be narrow and shallow. And the annual cycle will continue until flooding waters start again in November. 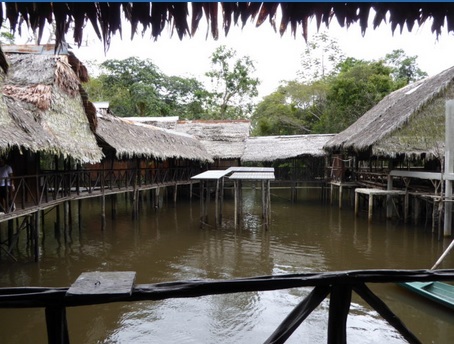 Because of the variability of the water levels, most everything is built on stilts. During May we are sleeping in cabins over water, connected by elevated walkways, also on piers. Come the dry season, we’d have to hike dry land to get to the same cabins. Despite water everywhere, there are few mosquitos. A palm-sized black spider managed to invade my cabin at one point. Calling the lodge staff to assist — I didn’t know if it might be poisonous — they removed the beast on a broomstick while they seemed amused that the gringo was frightened. Bats and total nighttime darkness add to the Halloween effect. The lodge offered a nighttime boat ride around the complex. You could see the bright nocturnal colors of the poisonous coral snake amidst other creepy crawlers under a star-filled sky accompanied by silence punctuated by jungle cicadas and the swish of the canoeist’s paddle. Truly a once-in-a-scary-lifetime adventure — the reason I and others keep coming. The experience tests you. There are no activities at this lodge. Most of the time is spent on boat excursions. After the night falls, you are left to your own devices to sweat, talk with other guests or perhaps listen to music on an iPhone that retains charge. Once that charge is depleted, getting it juiced up proves to be a chore. Tahauyo offered a charging station in the communal dining room where meals were served buffet style. But the juice only flowed for 4 hours a day. And my cabin was a good 5-minute walk from the dining room. The boat excursions are exciting — a visit to a nearby village, a visit to a nearby artisan’s market set up for our arrival, a ride to a jungle lake to swim with dolphins, a hike up a jungle hill looking for a tiny, poisonous frog, ziplining, handling anacondas, birding or fishing for piranhas from the boat, even spear fishing in season. All are new experiences to get the adrenalin rushing. Many of these activities can be found at places far more accessible than the Amazon. Still there’s something special about doing them there. I’m convinced it’s the allure of getting there, coming to terms with your fears and successfully living outside your comfort zone (still in relative comfort) that attracts visitors. Then you go home and tell friends just how severe the experience was — to unintentionally keep the myth alive — as you embellish on what was, in fact, an enjoyable and exhilarating personal growth experience in nature.